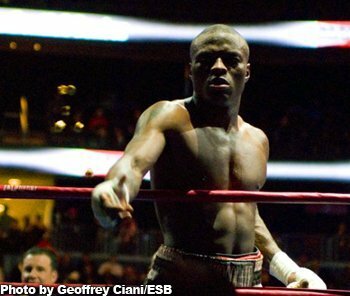 Exclusive Interview by Geoffrey Ciani – Last night I was afforded the opportunity to speak with middleweight contender Peter ‘Kid Chocolate’ Quillin (27-0, 20 KOs), who will be challenging WBO champion Hassan N’Dam N’Jikam (27-0, 17 KOs) on October 20 at the Barclays Center in Brooklyn, New York. Quillin spoke about his career, including his most recent victory against Winky Wright, his preparations for his first title shot, and what he feels he needs to do to be successful and capture his first world championship. He also provided his views on a variety of recent contests that have occurred in and around his weight class, including: Sergio Martinez’s victory over Julio Cesar Chavez Junior, Gennady Golovkin’s impressive knockout against Grzegorz Proksa, Daniel Geale’s upset win in his unification bout with Felix Sturm, and Andre Ward’s one-sided showcase against ‘Bad’ Chad Dawson. Here is a complete transcript of what Quillin had to say. GEOFFREY CIANI: Hello boxing fans. This is Geoffrey Ciani from East Side Boxing and I am joined by undefeated middleweight contender Peter ‘Kid Chocolate’ Quillin. How’s everything going today, Pete? PETER QUILLIN: I am super blessed taking everything one day at a time. How are you doing? CIANI: I’m doing very well. Thank you, Pete. You have a big fight coming up October 20 for the WBO middleweight title. You’ll be taking on Hassan N’Dam N’Jikam. How do you feel about your preparations and training for this fight? QUILLIN: I’ve been here already two and a half months, almost three months now, so I’m feeling in shape. I feel good. Sparring has been bringing the best out of me. So this opportunity coming my way, I’m going to be more than ready to knock down that bridge, and to go ahead and let everybody know once I rebuild the bridge, that it’s going to be a better looking bridge. It’s going to be a better champion that owns this belt. CIANI: Now what do you think of your opponent as a fighter, Pete? What do you think of his skills and his abilities? QUILLIN: I think his ability carried him this far. I have to respect him as a champion and give him his respect as a champion. I think he has good skills to be on the level that he’s at right now, and that’s why this fight is being made because I want the belt. I want a belt, and I’ve been saying this for a long time. This is my opportunity, and I know, and I’m not going to take anything away from him because he’s fighting for an opportunity for himself. But you know one of us has got to go up in there and prove it in the fight, and show the fans who really wants it more. That’s what I’m trying to challenge and prove to myself that I’m able to get this belt when I get this belt. CIANI: You’re 29 years old now. How does it feel to be getting this opportunity to finally get your first shot at the title? QUILLIN: Oh! It feels like it’s a blessing in disguise. You know being 29 years old, people that know that I’ve been a seven year pro, so I haven’t taken no punishment at all in my career. But going ahead to fight for the title now, it’s right on time! So all I have to do is capitalize on this opportunity, go in there and put my best foot forward, and get this belt. CIANI: How would you evaluate your last performance when you defeated WInky Wright? QUILLIN: I always give myself, I’m the worst critic of myself, so I give myself a 7 or 8, because I never think a fighter can have a perfect performance. You can’t always be happy because you got to be able to be willing to understand that you got to work towards things in a fight and get better from it. So that’s what I do. I take my performances and see where I could have done better, and taking it to the next fight to be a better fight. CIANI: Pete, when you first decided to make the move out to the west coast, did you ever imagine that you would develop and progress the way you have to reach this point where you’re at today? QUILLIN: I mean I’ve been working on it my whole career, working my whole life to be at this point right now where I’m fighting for one of the biggest opportunities. This is like when a guy gets his first million dollars on Wall Street. Or this is the guy when he goes to a car lot and he’s able to buy his first car. This is a guy when he’s next up. Or this is a guy who’s already had a dream to become a clothing designer when he launches his first brand. So this is my chance and this is my start to where I want to be in my life. You know what I’m saying? So you know fighting for this opportunity proves a lot to myself. It proved that a guy who started from nothing can actually make nothing into something. CIANI: How does it feel for you to have your first fight, it will be in Brooklyn, your first fight on the east coast in a number of years? QUILLIN: Oh I feel blessed, and I still live in New York City. I am from Grand Rapids, Michigan originally, so I never want to disrespect them. I have always had a dream to go back home to Grand Rapids to fight, but I live in New York and I consider myself a New Yorker. I’ve been there twelve years and had 18 professional fights there. I built up a credible name for myself there in New York, and I’m very blessed with that. So with that being said, it’s just like my life is only going to go up the ladder even more because I’m just dedicated to this. I think about this 24 hours a day. The only time I try not to think about boxing is on a Sunday, and I try to give that to the Lord, but even then I’m always having a mental attack with boxing and working at the pinnacle of where I want to be, which is being a champion. I’m very blessed to be able to do that in Brooklyn, New York, not having a fight of this magnitude in over 53 years. We’re having a fight of this magnitude in Brooklyn, so being a part of history is always something I want to have my name attached to. CIANI: Pete, the last few weeks there’s been a lot of action going on in and around your weight division. I was wondering if I could get your opinions on some of those fights that have taken place, and I’d like to start with the middleweight championship fight last weekend between Sergio Martinez and Julio Cesar Chavez Junior. What did you think and were there any surprises for you? QUILLIN: Yes I was very surprised that Sergio looked as good as he did and then going into the last round he gets hurt and got dropped by Chavez, and everybody looked at that more than they looked at the rest of the performance. Like give the guy credit. The guy did what he had to do. Well he didn’t do what he said he was going to do. He said he was going to knock Chavez out, and he didn’t do that. For that being said, Chavez, training along side of him, I’d seen a different fighter. Before I had seen a lot more fire in before than what I had seen in that fight. You know I really can’t necessarily say what he’s going to do as a person you, because that does have to do with a lot of things. You know what I mean? A lot of pressures and everything, and I go through a lot of pressures at the same time, but I just want to motivate myself and use the all the stuff that goes on outside of the boxing ring. I use it to be motivated to get better and work harder. I wish Chavez would have done that before his preparation, and show the fans that you’re getting ready for fights. Everyone, they actually want to see you in a boxing gym getting ready, and he didn’t do that. But you know not to disrespect the guy. He did go in up in there and put in his, I guess best performance that he could with his conditioning. Going twelve rounds with what some would consider the best middleweight out there, until they see me—you know what I’m saying?—I give him a lot of credit for that. I did say that he was very disrespectful, and I’m not going to take those words back. As superstar boxers, as celebrity boxers, we hold a thing where we have to make sure that we’re respectful to the sport and we’re respectful to the fans, because we owe that to them! These are the people that come back and support us, and boxing pays people’s bills like it pays mine. CIANI: Another fight I’d like to get your views on took place a couple of weeks before that. Gennady Golovkin made his HBO debut. He had an impressive knockout victory against Proksa. I’m wondering if you could tell us what you think of Golovkin as a fighter, and what you think of him kind of making a splash in the middleweight division with that victory? QUILLIN: Oh! I think he looked good. He did what he was supposed to do, and for stepping in there with a guy like the guy from Poland who was coming I guess to try to do his best to win, and him making a splash here. I can’t be mad at that! That only makes my middleweight division better and with more to watch for. So I can’t be mad that another guy like him came into this country and was trying to make a name for himself. I can understand. He’s been calling me out a lot, and saying things about wanting to fight these names. Hold your horses, fella! You just got on national TV over here. Build up your name a little bit. We all do this for our legacy and we all do this for the bread and everything like that, but for me, what I started to do is I let my people that handle my business come to me with the opportunities, and not to be disrespectful towards fighters no more. I’m trying not to be like that way, because having a big ego and having a big heart can sometimes get you in trouble and run you into something that you aren’t ready for. CIANI: Another fight that took place in your division, Daniel Geale scored somewhat of an upset against Felix Sturm. I’m wondering if that result surprised you at all? QUILLIN: No, because I think every fight as a boxer is a 50-50 fight. Once you step in there, one punch can change the fight, so I give credit to the guy to basically say that he did what everybody was doubting him to do, which was winning. So he went into there to somebody else’s backyard, and it’s the same thing I have to respect about Hassan who’s coming to my backyard and fighting me. So I have to give him respect that he’s fighting for the opportunity more than what people are thinking that he’s not able to do. So with that being said, I give a lot of respect and a lot of credit to Daniel for coming to his backyard and fighting him. Now he’s unified two of the belts and brought them together. So a lot of people like to see stuff like that. I hope he gets the fight that he would like to see, and I’d be open to fight him. But one fight at a time, and I have to look down the line as far as Hassan, because I have to take him as seriously as any other champion out there and make sure that I’m going up in there and setting my foot forward to see where I want to be at in boxing. CIANI: Pete, one more fight I’d like to get your opinion on. It was a surprise to me. I thought we were going to get a really close competitive fight, and Andre Ward made it look easy in there against Chad Dawson. What were your views on that one? QUILLIN: Well a guy like Andre has something special that I believe. You know I’ve been watching the guy, and what he fights for and stands for is good for boxing. So I’m very happy to see a guy like Andre’s doing his thing. I give props to that. You know one guy’s failure is another guy’s victory, and that’s what happened in that fight where Chad thought he was ready for fighting Andre Ward, and you know he was putting himself up where Andre’s at, and Andre showed him why he wasn’t. And I think it was just an all around good fight. I was entertained by the fight, and I’m just glad I was able to watch it live. It was one of those type of fights where I’m going to be able to look back and be like, “Man! Did you see Andre Ward versus Chad Dawson”? And have a lot of good things to say about the fight. CIANI: Pete, back to you, I know you mentioned a moment ago that you got to take things one fight at a time, and obviously you have the biggest fight of your career coming up and you don’t want to get ahead of yourself. But in the event you are victorious in capturing a portion of the middleweight title here, is there anybody in particular that you’d most want to mix it up with after that? QUILLIN: You know I’m going to let my people just bring the opportunities. Pete ‘Kid Chocolate’ holds no prisoners! You know what I’m saying? The chair is going to be filled with whoever wants to go in there. So at the end of the day with me in that birdcage right there, only one bird is going to be able to make it out, and that’s what I’m training for: to be able to make it out of the cage. With me saying that, I’m not trying to be cocky. I believe in my skills. Skills pay the bills. I’m very humble with the platform that God has given me. When I say that, I mean like when I’m performing and I’m trying to inspire people along my journey to make sure they know that a guy like me came from nothing, and if you ever come from nothing you have to work very, very hard to make something out of nothing. Anybody is on the menu, just like I’m on the menu for other guys. If a guy is calling me out then you know what? I’m actually going to say this: I’m on so many guys’ menu right now that it’s not going to be hard for me to get a fight. So until I can’t do that, then I will have to call somebody out if I need an opportunity. I’m in a good place right now where God has blessed me to be able to make boxing a 24 hour job for myself. I go in the gym and train hard and I’m inspired and motivated by what I know is ahead of me, and I’m just working, working, working, working, working like I ain’t trying to give up, and I’m working like I still ain’t got nothing. CIANI: What do you think are your keys to victory on October 20? QUILLIN: Smiling with no mouth piece, being happy, having fun, you know just going in there and just believing in the skills. Let the skills pay the bills, meaning like I’m going to do what’s natural to me. A lot of guys get ready for me, and they get ready for the wrong ‘Kid Chocolate’ because I got many ways to my game that I can fight. I can bang, I can jab, I can use my speed, I can use my head, I can work with my defense—I can do it all! And I’m working hard to keep that going and make sure that when I step in a fight, that I’m training not only to beat guys but I’m trying to win big and beat guys with flying colors to make sure that I win very big. So when I step in there October 20 you’re going to see ‘Kid Chocolate’. You’re going to see no difference. You’re going to see the hard-working ‘Kid Chocolate’ that you guys have always seen. The guy that just believes in himself, and I know I got something special and I’m just adding on to that in the training. CIANI: Do you have an official prediction for your fight? QUILLIN: Winning big! Oh, that’s going to happen. My manager in the background said “pain”. I said that’s automatically going to happen. So the prediction is that ‘Kid Chocolate’ is going to be very victorious, he’s going to inspire his fans while he’s in Brooklyn, they’re going to want him back, and then I’m going to smile and I’m not going to have my mouthpiece in, so I’m going to have my missing tooth showing. Then I’m going to have many people telling me, “Well if he’s making money then why hasn’t he bought a tooth yet?” And it’s because I don’t want to! It’s because I’m going to keep doing this the way I want to do, and I’m going to make sure that I’m smiling and having fun in that ring. So when you see me, you’re going to see an artist painting a picture for you guys and all the fans. CIANI: Pete, for my final question for you: is there anything else that you would like to say to all the boxing fans out there and all of the readers of East Side Boxing? QUILLIN: I want to thank East Side Boxing for giving me a call on a wonderful night, a great day of training, to catch the latest and greatest on me. I want to thank all the fans who listen to the interview, watch the interview, and read the interview here at East Side Boxing, because this is a website for real boxing fans where it gets real fighters like myself’s story out there, and I’m very blessed with this situation. I also want to tell everybody to follow me on Instagram @KidChocolate and also follow me on Twitter @KidChocolate and I got my website up at thekidchocolate.com thekidchocolate.com and I have tabs up there where I have a store where you can buy shirts. Just support my whole thing right now, and it’s all a class in the making. I’m working towards greatness, and everyday I’m going to keep doing it. CIANI: Pete, I want to thank you for your time. It was an absolute pleasure once again getting the opportunity to speak with you here today. I wish you the best of luck in your title challenge on October 20, and I wish you the best of luck going forward in the rest of your career. QUILLIN: Thank you! God bless and thank you for having me on! Previous boxing news: Alexander Povetkin: Kostya Tszyu doesn’t want a new fighter!